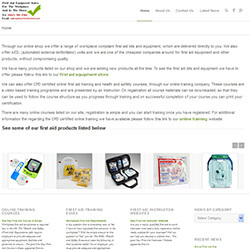 We have just completed a news website for www.first-aid-equipment.co.uk, they wanted an independent news website so that they could keep customers up to date with the products and services that they offer. This website is not only just a blog for their latest news and information, but the website also has some information pages, contact page and a product information slider, listing some of the products that are available through their shop. Customers can click the images and be taken directly to the product page within their online shop. To visit their news website please click the picture on the left to be taken to the main website, or to see their latest news you can can follow this link to their news pages.